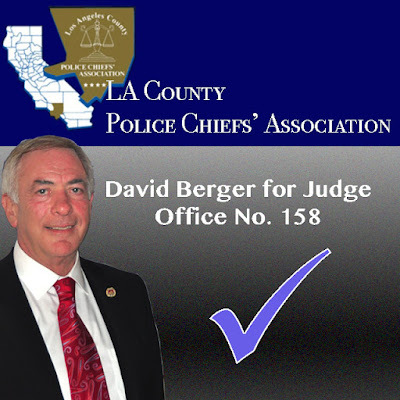 Very proud, and deeply honored to announce that the Los Angeles County Police Chief's Association, representing the Police Chief Executives of the 45 independent cities in Los Angeles County, has endorsed David Berger for Judge of the Superior Court. The Association focuses on advancing the science and art of police administration and crime prevention in Los Angeles County; coordinating the implementation of law enforcement efforts by local law enforcement leaders; and developing, teaching, and disseminating professional law enforcement practices. They say that time flies when you are enjoying yourself, and this campaign has flown by. The polls will be open in 43 days, and the campaign is in good shape. Media endorsements, a good ballot title, slate mailers, a ballot statement, and attractive yard signs all adds up to a robust campaign that connects with voters. If you haven't already done so, please click on the 'Donate' page and help to ensure that my campaign has all the resources necessary to secure victory on Election Day. Please also remember to tell your family and friends to vote David Berger for Judge, Office No. 158. LA Times Renews Endorsement Ahead of Runoff Election "Berger Is The Best Choice"
Friday, September 9, 2016, just 60 days to Election Day, the Los Angeles Times renewed their endorsement of David Berger for Judge of the Superior Court, Office No. 158. 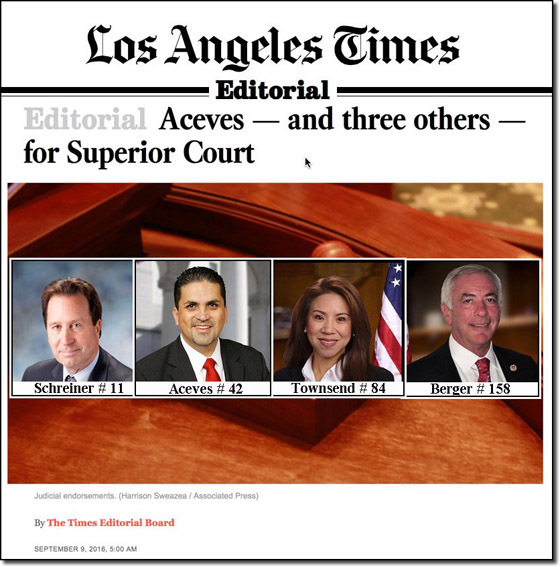 The LA Times added my colleague and fellow Deputy District Attorney Efrain Aceves, candidate for Superior Court Office No. 42, to their previous endorsements for the November 8, 2016 election. With Presidential politics dominating the election season, the LA Times endorsement is perhaps more critical then ever in helping voters make decisions about their choice for judge. In 5 words the LA Times says it all "Berger is the best choice."